The price of a Avnix forklift bucket is less than a two month skid steer loader rental. Strong heavy-duty construction guarantee long life. 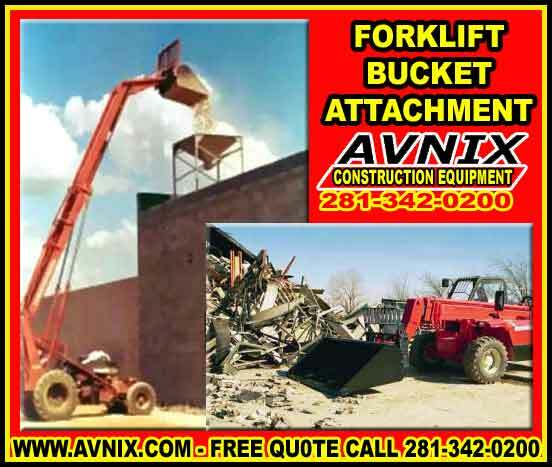 Intended use for telehandler or extendable-reach forklifts, Avnix Forklift Buckets allow positioning of material far further than the reach of a loader. Connects directly to the end of boom by way of a quick-tach connector which forms a solid connection between the bucket and forklift. Specify forklift make and model when ordering “Quick Tach” buckets. Long forks are not a problem with the QT style because the forks and carriage are removed when the bucket is installed. 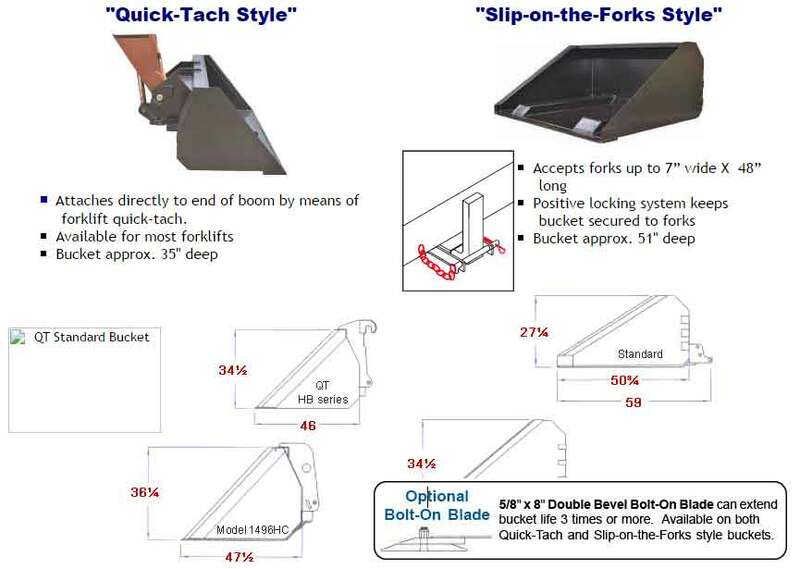 Always choose the Quick Tach style bucket if the forks on your forklift are longer than 48”. More of the forklift’s capacity is free to lift heavier loads. Dropping the forks and carriage saves 700 to 1000 lbs. Universal Fit – can be used with any make and model of skid steer or extendable-reach forklift that is outfitted with normal 48” long forks. Forklift b bucket attachment slides on the forks and is pinned behind the heel to secure it to the forklift. Forks and carriage stay on forklift, therefore they are less susceptible to loss or damage. Quick and easy to install. Deeper bucket move odd shaped material easier. Since the forklift bucket is significantly deeper, debris such as broken cement, lumber scraps, and other trash stays in the bucket better. It also has greater load capacity. AV-1460 60″ 0.80 yd³ ± 640 lbs. AV-1460HB 60″ 1.00 yd³ ± 770 lbs. AV-1472 72″ 1.00 yd³ ±770 lbs. AV-1472HB 72″ 1.25 yd³ ±925 lbs. AV-1496 95″ 1.25 yd³ ±950 lbs. AV-1496HB 95″ 1.65 yd³ ±1050 lbs. AV-1496HC 95″ 2.00 yd³ ±1235 lbs. Gehl Dynacarrier, JCB QFit and Pettibone quick-taches require HB or HC series buckets. AV-1406B 72″ 1.20 yd³ 670 lbs. AV-1408B 95″ 1.60 yd³ 760 lbs. AV-1408BHC 95″ 2.00 yd³ 900 lbs.